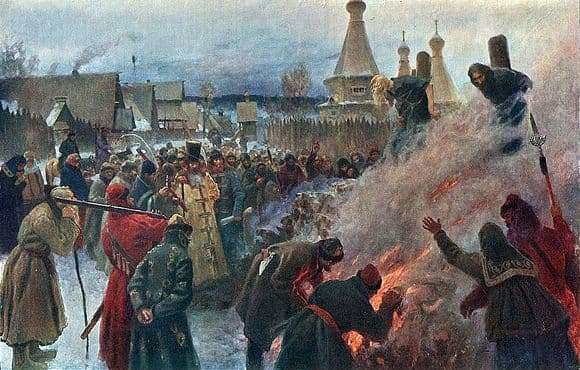 The picture “The burning of Avvakum” in 1897 illustrates the execution of Avvakum. First, Protopop spent several years in prison, where he starved and suffered mockery. After that, he was sentenced: burning alive. The residents of the city of Pustozersk came to see the “spectacle”. Myasoedov accurately conveyed fiery tongues, which are about to swallow the figures of two suicide bombers, whose hands are tied to the pillars. Avvakum is a gray-haired grandfather who adhered to the old “faith.” He looks exhausted, but he still has a lot of strength to defend and lure people to believe in the “true” faith. He stands in a bent position and as if trying to look into the eyes of every person before he dies. A bright spot in the picture is a boyar in a gold robe, a clerk with a royal decree, who read it before the beginning of the burning, and a priest. They are representatives of the authorities. And its defenders here are the archers, who are dressed in red caftans and stand by the fire to prevent the raid of the people. The crowd is divided into two camps: those who pity Avvakum, and those who show indifference. Sympathizers obviously lose by their numbers: we see a woman with arms outstretched and a man with a raised hand in a two-footedness – a symbol of the “old” faith. Myasoyedov was able to achieve a direct resemblance to the crucifixion of Christ at Calvary. This is evidenced by the spear of the archer, the unfortunate suicide bombers, the church in the background, indifferent inhabitants. The artist supposedly wishes to inform the viewer: the consequences of the tragedy will be of enormous size. Indeed, after the execution, the adherents of the “old” faith massively began to move to other countries.